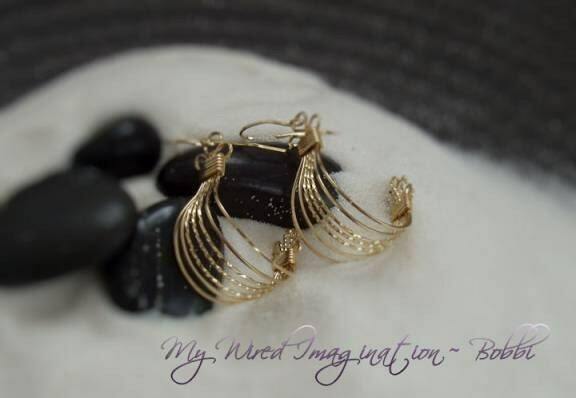 Tutorial - Antique Style - All Wire Earring - PDF file by Bobbi @ MyWireImagination. This lady has incredible ability to create jewelry very, very professionally, I admire her passion and her talents for so long, I wonder if she will ever write a tutorial - and now here it is, she is such caring person that want to make people that loves her works happy, she forked out as much time as possible each day from her busy schedule, to write this tutorial. I am s.e.r.i.o.u.s. - I got update from her almost everyday - she come back from work, went out again without taking some rest, to work on the photos for her tutorials eventhough she was tired ! And when asked, she claimed that she is pretty much recharged when she has all findings in her hand! I strongly recommend you to check out this tutorial, Bobbi made an effort to make the tutorial simple enough to follow, and proposing the safetest way to compose this pair of earrings - by right if you miscalculated the length of the wire, the piece is pretty much ruinned, Bobbi made some changes to the formula so that you won't go wrong creating this. The pictures are clear and the instructions are easy to follow, Bobbi has very strong command of language and won't give you any ambiguous statements in her tutorial, and she gives suggestions - like at which stage you might want to apply some changes to create some different effects. I LOVE THIS TUTORIAL! It is now available at her Etsy store, for more information please check out her blog.